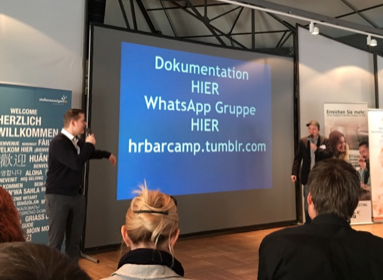 On February, 25th and 26th, Christoph Athanas and Jannis Tsalikis hosted the HR Bar Camp in Berlin. This year Textkernel decided to sponsor this successful event and Jakub, Sandra and I attended. 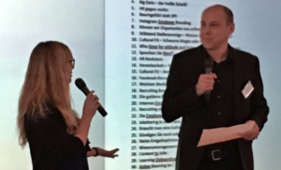 200 recruiters and HR professionals, who managed to get one of the highly coveted tickets, started off, led by Jannis, with a small Bar Camp rap. In the session pitches all attendees could present their suggested topics. From a record-breaking 48 proposals, covering all aspects of HR, our topic ‘#SourceYourATS – why are companies not using their internal talent pools?’ was one of the chosen ones. After inspiring sessions about among others active sourcing, KPIs in recruiting and ‘BigData and algorithms’, in which also Search! and Match! were mentioned, it was our turn to present. Searching for candidates in your eRecruiting system is usually a nightmare – it is very difficult, if not impossible, to retrieve a suitable candidate from a large amount of data. Over the years, many thousands of candidates have been collected and are saved in your database. These candidates are already interested in your company, still recruiters do not start their processes within this source. Almost two thirds of companies do not even know how many candidates are in their database, let alone what skills these candidates have. We discussed with the HR professionals how a good and searchable talent pool can be used and why this happens so rarely. The participants of the session initially collected reasons that prevent them from searching effectively. …and why it does not work! Consequence: for many recruiters, the standard procedure is to place a job ad and wait for applications – the infamous ‘post & pray’. If still nothing happens they ask for external help, often with little success. It was agreed that most of the identified reasons actually are not showstoppers for using your own talent pool. Even the concerns can be eliminated by a few simple measures. So how can you convince your boss and your colleagues to get more out of your existing profile collection, which you already spend money and resources on? How can we encourage more active use of the company’s talent pools? Looking at the money usually helps! 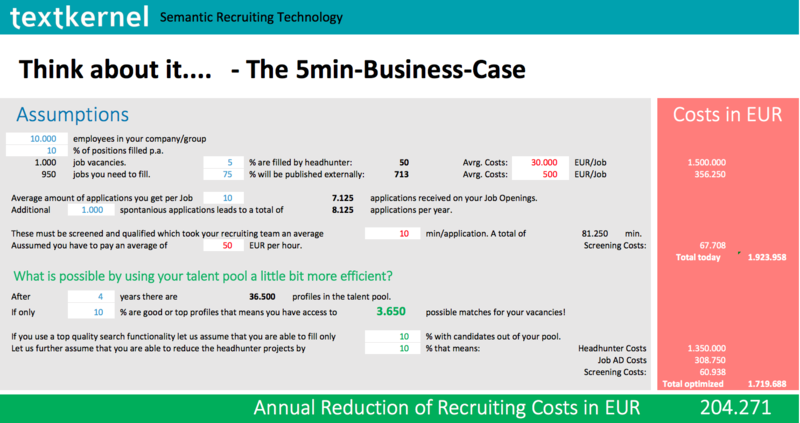 Conclusion: the technology is there to finally get more out of your own talent pool, but it has to be more present in the minds of recruiters to change their standard processes and start saving money. Sounds simple, right? Also applicants are very happy about this change of mind: 42% of all candidates are happy when the saying “even if it did not work out well this time, you have convinced us and we would like to stay in contact with you” is more than just a hollow phrase. Some participants even reported that the response rate of candidates who have applied before is as high as 100%. All in all, an exciting session with inspiring participants and hopefully a lot of food for thought on the subject. Recruiting maniac, employer-branding addict, HRIS obsessive and networker by heart, that’s Marcus Fischer. For Marcus, there is nothing more exciting than to deal with the ‘human’ resource; the theme of HR has never left him since his studies. He previously worked at Audi and the Baloise Group as employer branding manager, now he inspires companies in Germany regarding Textkernel’s products. Get in touch with Marcus! Curious about Textkernel? We are growing and hiring!